Fancy brightening up your style for summer? Well look no further than our awesome range of neon piercing jewellery! Neon accessories are a huge trend this summer and they are great for festivals. These brightly coloured pieces perk up your whole outfit and make a gorgeous way to stand out wherever you go. Much of our neon piercing jewellery is also UV reactive, so they glow brightly as soon as you get near a UV light – perfect for clubbing! We have a huge range of neon navel piercing jewellery, from simple neon ball bars to flexible materials that bend with your body. Below are three of our favourite neon bananabells. On the left is one of our flexible belly bars. These bars are made of flexible PMMA that reduces stress on your piercing. It is very comfortable to wear and as you can see, the colours are awesome! UV flesh tunnels are ten a penny but true neon tunnels are surprisingly hard to find. I recommend Kaos silicone tunnels and eyelets, three of which you can see below. These silicone eyelets come in a choice of blazing neon colours that really shine. They are also UV reactive and made from flexible silicone. They are so light and comfortable to wear, completely non-irritating and simply gorgeous to look at – what more could you want! This entry was posted in Acrylic Body Jewellery, Silicone Body Jewellery and tagged Navel and Belly Button Jewellery, navel bananabells, Navel Bars, Piercing Threaded Balls, silicone piercing jewellery, silicone stretching jewellery, silicone tunnels, Threaded Balls on May 8, 2012 by Piercing Guru. Make sure your navel piercing looks and feels great by wearing titanium navel jewellery. There are literally thousands of different types of navel jewellery out there but in my opinion, you can’t beat titanium navel jewellery. Titanium is the most biocompatible metal used to make body jewellery and it is great for navel jewellery. Titanium navel jewellery is hypoallergenic, non-irritating and extremely biocompatible. This is because titanium is a pure element, not an alloy like surgical steel. It does not contain cheaper metals like nickel that can irritate your skin. Some people get on fine with surgical steel but personally I find that my piercings are more likely to get sore and they take longer to heal up when I wear steel jewellery. Titanium navel jewellery on the other hand speeds up my healing time and I have never experienced irritation from wearing titanium navel jewellery. For a simple, stylish look I recommend plain titanium navel jewellery. 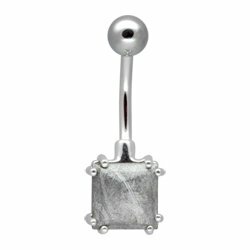 Here at Body Jewellery Shop we have a great choice of plain titanium jewellery like these three navel bars. Titanium can be anodized to make it blue, green, purple or multicoloured and it looks amazing against your skin. These plain navel bars are comfortable to wear and come in a great choice of sizes and styles to suit your taste. This entry was posted in Belly (Navel) Piercings, Navel Bananabells, Titanium Body Jewellery and tagged Bananabell, Bananabells, Belly Bananabells, Navel and Belly Button Jewellery, Navel Bars, Navel Jewellery, titanium piercing jewellery on October 28, 2010 by Piercing Guru. 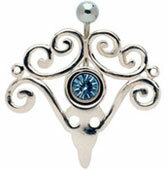 Now you give your plain belly bars a whole new look with a navel orbital. Navel orbitals are pieces of jewellery that fit onto a belly bar, adding a charm, motif or extra section. They can be used on any of your favourites belly bars and make it easy to update your look. 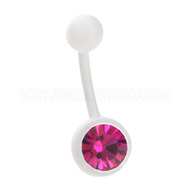 Navel orbitals fit over the ball of your belly bar but they can hang from the top or bottom ball. The image on the right shows a silver navel orbital hanging from the bottom ball of a jewelled belly bar. I really like navel orbitals because they are a cheap way to update your piercing. They also mean that I can keep the same belly bar, which is important for me because I am sensitive to metals. Once I find a belly bar that feels comfortable I would rather wear the same one with a navel orbital than switch it for another bar. This entry was posted in Belly (Navel) Piercings, Navel Bananabells and tagged Belly (Navel) Piercings, Navel Accessories, Navel and Belly Button Jewellery, Navel Bar, Navel Bars, Navel Jewellery on September 22, 2010 by Piercing Guru.